Dragon continues to expand its inventory of leading industry brands in their used equipment online marketplace. “We wanted our customers to know that auction is neither the only nor the best option if they want to liquidate or purchase equipment." 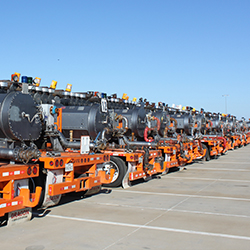 Dragon Products, LTD now has over 250 million in used and a like new surplus of Frac and Stimulation Equipment, which also includes Tractor Trucks and Trailers from Peterbilt and Kenworth. Frac and stimulation inventory items includes trailer mounted 2500 HP frac pump units, frac tanks, frac blender units, hydration units, chemical additive trailers, Sand Dragons, high power manifolds and more. Dragon has been manufacturing, selling, and servicing rigs, tanks, trailers, roll off equipment, pumps, and hydraulic stimulation equipment to support drilling and oilfield customers for more than 50 years. To offer their customers a viable alternative to auctions Dragon's used equipment online marketplace now showcases leading brands of oilfield equipment from the largest collection in the world. “We wanted our customers to know that auction is neither the only nor the best option if they want to liquidate or purchase equipment. Why risk an uncertain outcome and put your future in the hands of an auction house that knows little if anything about oilfield equipment? No one has the reach, the inventory or the industry knowledge and technical expertise that Dragon offers. For anyone looking to buy, sell or consign equipment Dragon adds real value to the transaction” says Mandy Raps, Dragon’s Marketing Manager. Visit http://www.dragonusedequipment.com to learn more about our 250 million dollar frac and stimulation equipment inventory located across the United States or call 844-4A-DRAGON to speak with a Dragon representative. For new oilfield and industrial equipment visit http://www.dragonproductsltd.com or call 800-231-8198. Dragon Products, Ltd is a U.S. owned and operated company that offers a wide range of quality, durable energy and industrial equipment. Their equipment and inventory includes mobile workover and well service rigs, oilfield and industrial storage tanks, transport trailers, surface production equipment as well as roll off equipment and RANCO dump trailers.